I spent the majority of June drinking all manner of fizzy things and iced coffee's, and I'm not sorry. What could be better than an ice cold beer, Spanish nibbles and the best views over Shoreditch?Nothing, that's what. No better way to spend World Gin Day than with a jug of lemon gin and men in tight trousers riding horses. One of London’s finest brunch spots. The one in London Bridge is particularly good. I always try to pick local foodie places over chains, especially when it comes to burgers, BUT Honest Burger is honestly the best of them. If you're looking for a spot to drink coffee and do some work in Shoreditch, this is the boy. Moët served on ice in the heart of Leicester Square. Sums up a pretty perfect sunny evening for me. The finest Aussie brunch can be had at Brickwood in Clapham. TIP: order a side of hash nuggets with whatever breakfast you go for. Iced coffee with a Baileys twist. It's a yes from me. Read about them here. 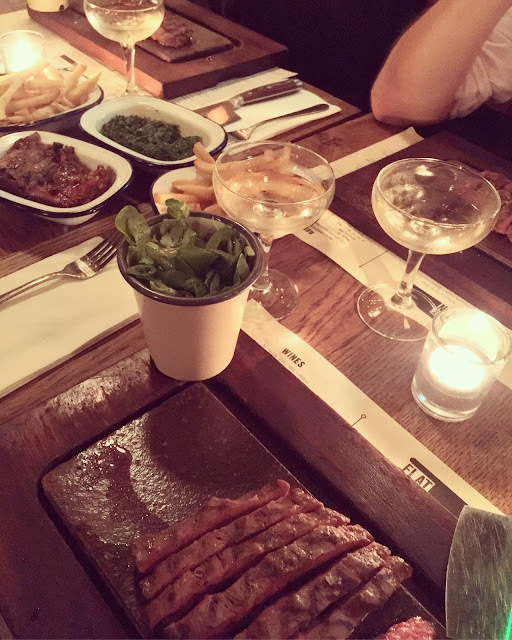 We waved goodbye to our blonde bombshell at work and what better way to do so than with steak and prosecco? Still my fave place for dinner in London. The cutest and most delicious deli in Soho. Get your coffee, fresh pasta, meatball sandwiches and dream of holidaying in Italy. I'm off to Barcelona this month to sniff out the best tapas, plzzz send your recommendations!